Black Ball Ferry Line provides the only daily, year-round vehicle and passenger ferry service between downtown Victoria, British Columbia and Washington State. The company's administrative offices are located in Seattle, with terminals and operations personnel at both Victoria’s Inner Harbour and Port Angeles. Employing over 100 people in peak season, the familiar sight and sound of the M.V. Coho has become a permanent fixture of the landscape in the region for over fifty years. In 2009, Black Ball Ferry Line celebrated its 50th anniversary of service as a vital tourism and transportation link between Vancouver Island and the United States. In 1959, Black Ball Ferry Line’s founders R.J and Lois Acheson contracted Phillip F. Spaulding & Associates of Seattle to design M.V. Coho. Her keel was laid on January 12th, 1959, at the Puget Sound Bridge & Dry Dock in Seattle. 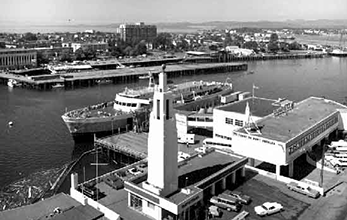 She made her first commercial sailing to Victoria on December 29, 1959. In addition to servicing the Port Angeles to Victoria vehicle and passenger route, the M.V. Coho also carried freight trucks between Seattle, Port Angeles, Port Townsend and Victoria. This service ended in 1973, when the company decided to focus on the Port Angeles to Victoria route. Since commencing operation in 1959, the M.V. Coho has transported more than 22 million passengers, and over 6 million vehicles. Through decades of operation, Black Ball Ferry Line’s flagship has developed an unparalleled record of reliability. View a detailed look at the illustrious history of Black Ball Ferry Line here.